Our return customers are every bit as important to By Choice as the new customers that choose to try us out for the first time. There are a number of ways that people hear about our quality appliance repair in Broomfield, Co. We are proud to hear about positive experiences that lead to new customers coming to us by word of mouth. They may come to us by word of mouth, referrals, our ads, fliers, and many other venues. We are family owned and proud to serve you and your family. We serve Westminster and the many surrounding communities in the North Denver Metro area. 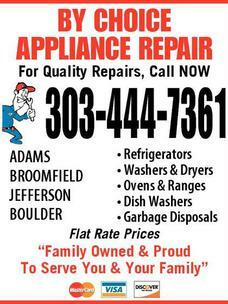 Copyright 2011 By Choice Appliance Repair: Appliance Repair Denver. All Rights Reserved.